As of May 2016, we are certified organic by MOSA. This means an inspector visits our farm annually to assess our fields, infrastructure, and records to ensure that we comply with all the standards in the National Organic Program. We believe the soil is our most precious resource. When stewarded, soil serves a multitude of ecologic and agronomic functions, leading to healthy and resilient crops. We employ a variety of cultural practices to mitigate the adverse effects of the annual cropping of vegetables: extensive use of cover crops, diverse crop rotations, use of organic amendments (compost and straw mulch), and the least aggressive tillage method for each application. We plant strips of native prairie in and around our vegetable fields. This provides perennial habitat for pollinators and beneficial insects, some of which prey on pest insects and decreases our need to control insects using other means. 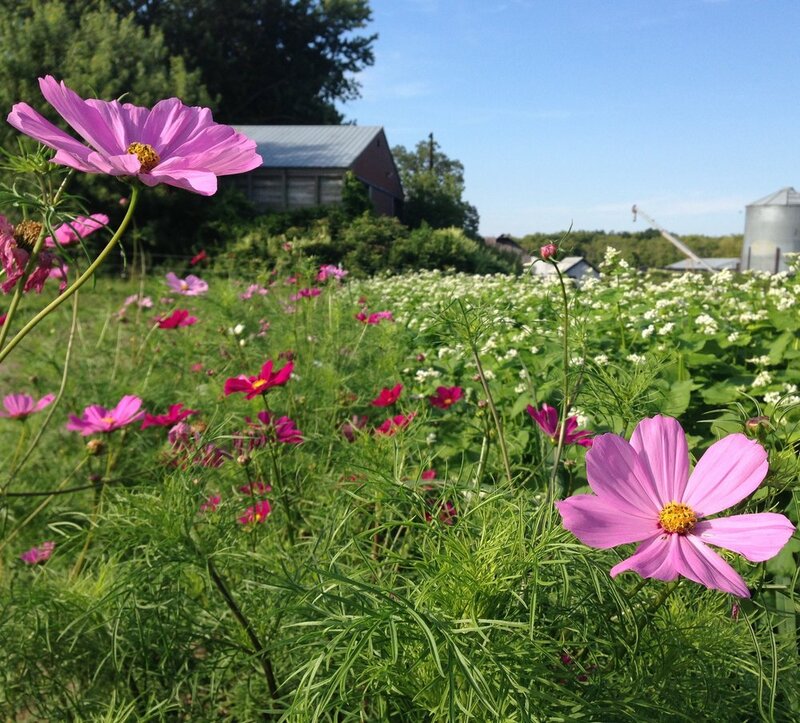 We also produce prairie transplants to help others enhance the biodiversity of their landscapes. 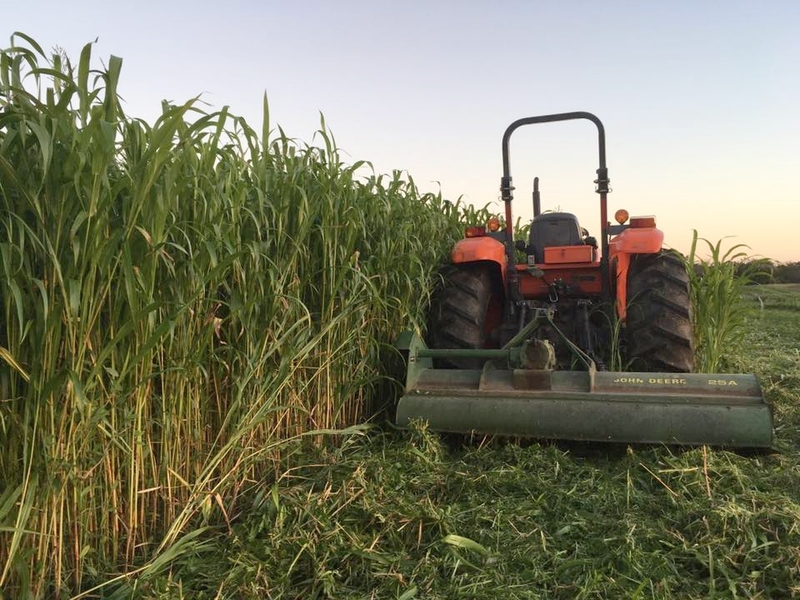 Intensive use of cover crops. In addition to reducing soil erosion and adding organic matter, use of cover crops can interrupt weed life cycles, suppress certain plant pathogens, and provide floral resources for bees and other pollinators (when growing cover crops like buckwheat and clover). Many conscientious eaters are increasingly concerned about pesticides. They are concerned not only about residues on fruits and vegetables posing health risks, but also the ecological effects of pesticide use. Like with soil management, we use a multifaceted approach to keep weeds, insect pests, and plant pathogens at bay. It all starts with a good crop rotation - that breaks up pest life cycles and reduces the pest pressure. Biologically rich soil and proper nutrient management create crop plants that are resilient in the presence of disease. Whenever possible, we also use preventative measures - such as excluding insect pests with row cover and reducing weed seedbanks using stale seedbed techniques - rather than reactive measures such as pesticides. Are we pesticide-free? Most years, no. As a last resort, we make judicious use of organic-approved insecticide and fungicide to allow for a marketable crop. We apply the products in a manner that minimizes nontarget effects (e.g. spraying squash plants for cucumber beetles late at night when bees are not out foraging). We think it is important to be up-front and transparent about our practices. Pest management is a constant struggle in organic agriculture, and we do our best to minimize inputs while providing the high-quality and reasonably blemish-free vegetables that consumers expect. Vegetables are living things. The moment the crop is picked off the plant, it begins to decline in quality as it mobilizes water, sugar, and nutrients for its own metabolism. However, those degradative processes are dramatically reduced once the produce is cooled down. For that reason, we place a great emphasis on rapid cooling of produce upon harvest, followed by continuous refrigeration during storage and delivery. Both farmers’ market and wholesale customers can expect only fresh produce with a long shelf-life. With that said, we aim to harvest our crops at their peak maturity for best flavor. Green tomatoes last longer than red ones, but who wants to eat those tasteless things?